In the weeks leading up to Easter this year, we want to make sure we “keep our eyes fixed on Jesus, the author and perfecter of our faith” (Hebrews 12:2). 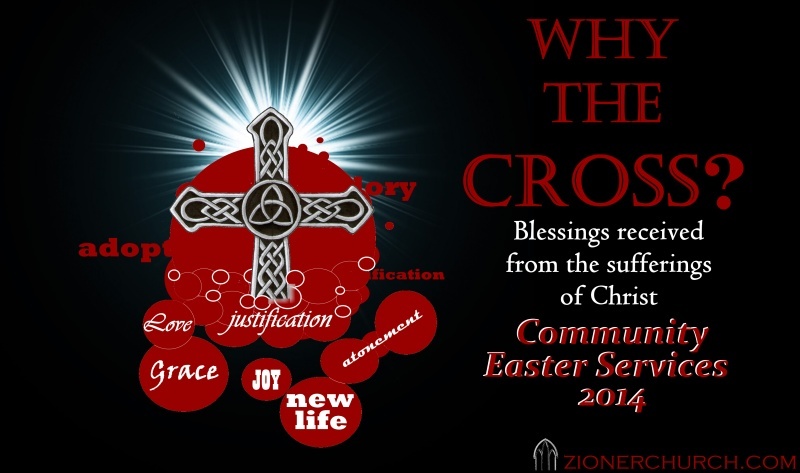 As we ponder our Savior’s obedience and suffering, we will ask the question, “why the Cross?” as we gather with the other congregations in town. We receive so many benefits from Jesus’ sacrifice, and we will take time to focus on each of these. Unless otherwise noted, all services will be held at 7pm at the host church, with light refreshments and fellowship afterwards. An offering will be taken that will be distributed evenly between the Garner Ambulance Fund, Meals on Wheels, Church Help Fund, and God’s Pantry. Questions? Call the church office. This entry was posted in ministry, news and tagged Easter, Passion, Passion 2014. Bookmark the permalink.